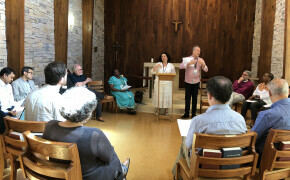 Anglican scholars from Africa, Asia, Latin America and the Middle East came together in Dallas for a Mission Theology in the Anglican Communion conference to exchange ideas and best practices in evangelism and witness. The academics from the Global South presented and discussed papers on mission and evangelism, while respondents from the Global North such as the United States and Great Britain offered feedback. Later, once final edits are made, the papers will be gathered into a book and published in advance of the 2020 Lambeth Conference. The book aims to explore the missional priorities of the Archbishop of Canterbury, the Most Rev. Justin Welby, who will write the book's foreword. The Rev. Dr. Lydia Mwanki, who is the Director of Theology, Family Life and Gender Justice at the All Africa Conference of Churches, wrote about evangelism challenges in Africa and noted a difference between faith and action. She said that Christianity is rapidly growing in Africa but at the same time there is a lot of behavior that is ungodly. The answer is ensuring more theologically grounded teaching of the faith and developing deep ecumenical relationships, she said. “We all need to strengthen relationships between denominations because one denomination can’t do it alone,” Mwanki said. The Rev. Dr. Albert Sundararaj Walters is a Malaysian national of South Indian background who serves as Vicar-General in the Diocese of Iran. He wrote about being genuine friends with those from other faiths and asking what it means to live one’s life as a Christian, Walters said. The Rev. Dr. Marianela de la Paz, of Cuba, wrote about how Christians should not consider themselves superior to non-Christians because it’s not their place to judge, but God’s alone. Christians, in humility, should build communities of love, peace and justice with believers of other religions and offer caring service to their neighbors. In response to de la Paz’s paper, the Rev. Canon Jordan Hylden asked, “… Is whether or not this distinction between Christ and church might help us both maintain the centrality of witness to Jesus Christ as Lord and Savior of all nations, as Lesslie Newbigin insisted on, while at the same time recognizing that we may always encounter Christ in a fresh way, or be spurred on to fresh obedience, precisely as we bear witness to him to all nations,” he wrote. The Mission Theology in the Anglican Communion project is sponsored by the Anglican Communion Office and aims to raise up new “doctors of the Church” in the global south to write, network, publish and engage with theologians in the global north, in service of the renewal of the worldwide Church and to deepen the ties that bind us together in one global fellowship as Anglicans. Others attending include the project's founder, the Rt. Rev. Dr. Graham Kings of the Church of England, and Dr. Muthuraj Swamy, its current editor, who has recently been named Director of the Cambridge Centre for Christianity Worldwide at Cambridge University.